Please click on the link above to download a copy of April Tips & Alerts. We hope that you find this information helpful and share it with someone else! If you know of anyone who would like to receive these updates, please forward it to that person and then encourage that person to share their email with us so they too can receive future updates from the Prevention Council Staff. -Best practices and patient care. Check it out here: Pocket Guide. By clicking on the link above you will be able to download a copy of the second issue of our Community Newsletter. We hope that you find this information helpful and share it with someone else! If you know of anyone who would like to receive these updates, please forward it to that person and then encourage that person to share their email with us so they too can receive future updates from our organization! 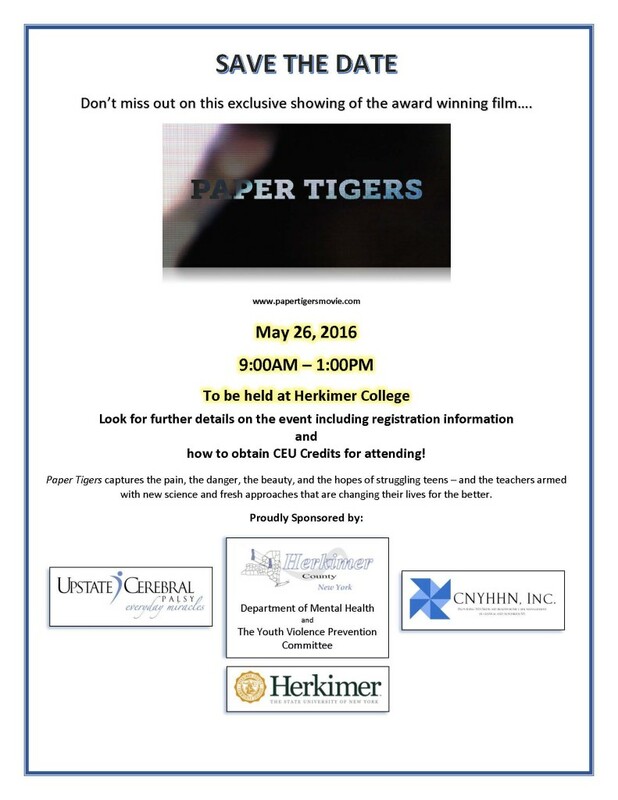 Upstate Cerebral Palsy, in collaboration with the Herkimer County Department of Mental Health and the Herkimer County Youth Violence Prevention Committee will host a showing of the documentary film Paper Tigers on Thursday, May 26, 2016 at Herkimer College. Paper Tigers, One High School’s Unlikely Success Story, is an intimate look into the lives of students at Lincoln High School, an alternative high school that specializes in educating traumatized youth. The film examines what trauma informed schools and communities can do to help youth struggling with the effects of Adverse Childhood Experiences (ACES). ACE includes verbal, physical or sexual abuse, as well as family dysfunction. The Centers for Disease Control conducted the ACE Study, one of the largest investigations ever to assess associations between childhood maltreatment and later-life health and well-being. Registration information and additional presentation details will be available shortly. As we work together to strengthen community based recovery, the voices of individuals, family members and allies impacted by addiction are our most valuable asset. To that end, we’re asking for your assistance in distributing the FOR-NY Recovery Needs Survey to your friends, colleagues, and family members throughout New York State whose lives have been impacted by addiction to alcohol or other drugs. The purpose of the survey is to determine the current needs, strengths, and gaps in community addiction recovery services and supports for individuals and families in recovery. Data collected will help FOR-NY understand priorities that should be addressed in the areas of needs, resources, and challenges for the Recovery Community. Ultimately, the data we gather will help us better advocate for improved access to quality addiction recovery services and supports for individuals and families. If you haven’t yet completed the survey, please click on the link below to complete it. (It only takes a few minutes! We promise!). If you have completed it, please consider forwarding it to friends, colleagues, or family members who’ve been impacted by addiction. All surveys must be received by March 31. Questions can be directed to Stephanie at scampbell@for-ny.org or 518-487-4395 x16. Thanks so much for your time. Your efforts to help us maximize the reach of this survey throughout the state will go a long way toward helping FOR-NY better advocate for improved access to quality addiction recovery services and supports for individuals and their families. The survey can be found here: https://www.surveymonkey.com/r/MCR9DWM. Yesterday the Senate passed the Comprehensive Addictions and Recovery Act (S.524), also known as CARA. This legislation was passed with a vote of 94-1 and now moves on to the House for its consideration. “On behalf of Center for Family Life and Recovery, Inc. (CFLR, Inc.), I would like to thank the Senate for its approval of CARA, specifically New York Senator Kristen Gillibrand and New York Senator Chuck Schumer. This is a major breakthrough for the recovery community, both locally and nationally,”’ as stated by Cassandra Sheets, LMSW and CEO of CFLR, Inc.
“CARA is very important to the work of CFLR, Inc. because it approves much-needed funding for evidence-based prevention, treatment and recovery programs to help Americans struggling with addiction to heroin or other opioids,” Sheets further stated. The abuse of heroin and prescription painkillers is an ongoing battle that our nation continues to fight. According to the Centers for Disease Control and Prevention, drug overdoses now surpass automobile accidents as the leading cause of injury-related death for Americans between the ages of 25 and 64. More than 100 Americans die as a result of overdose in this country every day. Expand access to addiction treatment, including medication-assisted treatment for heroin and opioid dependence. Provide funds for addiction recovery programming and substance use prevention efforts. Create new opportunities for people to receive drug treatment instead of incarceration. To view the videos, visit the NYS OASAS Access Treatment web page, or view the following links: Introduction to Treatment, Understanding Your Health Insurance Benefits, Inpatient Detoxification, Inpatient Rehabilitation, Outpatient Treatment, Appeals Process, Patient Safety, Communicating with Health Care Provider, When Family/Loved One Wants to Help, and Relapse Prevention. Please click on the link below to download a copy of March Tips & Alerts! To see the rest of this article, visit Utica OD. For more information on where to get help locally, visit Utica OD. Utica, New York (March 2016) – The recovery community is speaking out to educate friends, neighbors, policymakers and the media about the reality of recovery. On Tuesday, March 1, from 6:00 to 8:00 PM, Center for Family Life and Recovery, Inc. (CFLR, Inc.) is hosting an event that will change the landscape of the area’s recovery community. Please join CFLR, Inc. as it discusses the benefits of becoming a Recovery Community Organization (RCO), a hub for recovery-focused policy advocacy activities. Attendees will be introduced to the various components of an RCO, and a brief presentation will be given to demonstrate how local recovery initiatives and outreach programs will be handled moving forward. The event will be held at CFLR, Inc.’s Utica office location (502 Court Street, Suite 401). Anyone with a desire to build a community that supports individuals and families on their recovery journey is encouraged to attend. Together we can change the conversation about addiction and recovery. For more information, please contact Judith H. Reilly, CPP, Services Director at (315) 733-1709 or jreilly@cflrinc.org. Center for Family Life and Recovery, Inc. is proud to be the area’s leading expert for advocacy, prevention, counseling, and training. As a community partner, it is important to us that we continue spreading the message of help and hope to our area and with those whom we work.